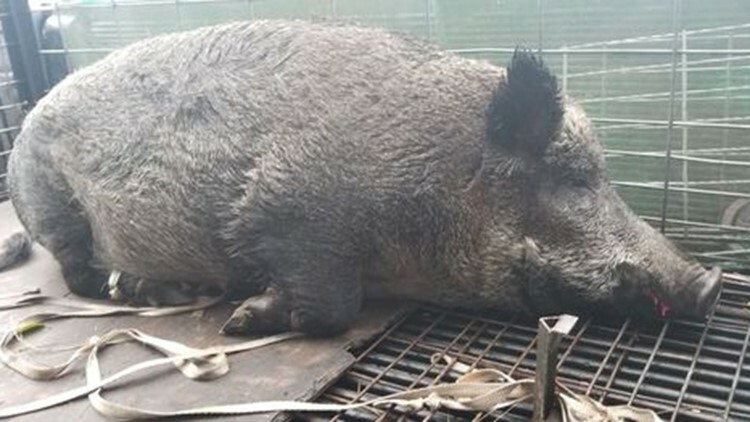 A team of dogs and men captured the Palm Bay hog and placed it in a cage. Melbourne hunter Steven Henson, who participated in the hog operation, said a cur dog named Chief single-handedly cornered the feral pig. A "massive" female hog weighing nearly 400 pounds was captured by a team of dogs and trappers Saturday morning in Palm Bay, just west of the bustling intersection of Malabar and Minton roads. The hefty Palm Bay sow had been prowling a wooded area near the Falls subdivision, Malabar Cove Apartments and Inspired Living at Palm Bay, an assisted-living facility. "Very seldom do we ever run into hogs like this, that are so massive and so big," said Melbourne wildlife trapper James Dean. About two weeks ago, Dean received a call reporting "a very large boar hog" that was tearing up sod around a playground, near a school bus stop. A nearby resident also sent him a nighttime photo of the great beast rooting behind a tree. The animal in the photograph is so large that it resembles a bear. "I took a deer trap out there. With the pig being that size, very seldom do you run into something that big. So what I did is, I used hurricane straps to strap that trap down — but the pig would not go into the trap at all after about a week and a half," Dean said. About 7:30 a.m. Saturday, Palm Bay police helped block traffic while Dean, four hunting dogs and four men converged on the scene. After releasing the hounds, he said the trained canines sniffed out and zeroed in on the colossal hog within 10 minutes. Melbourne hunter Steven Henson, who participated in the hog operation, said a cur dog named Chief single-handedly cornered the feral pig. Chief is owned by Brian Carr — who tangled with the wild animal. "It was definitely a mean one. When Brian went to go and try to 'leg' it — basically, when you flip the hog when the dog is grabbing it — the hog kept on charging Brian five or six different times, trying to bite him," Henson said. "It was definitely a mean hog. And it definitely needed removed, being close to a school bus stop and homes in general," he said. The men captured and hogtied the hulking swine, then lugged her into a cage. "A lot of the times when we run into calls like this, it's usually people who pen a hog up up in their backyard and grain-feed it, and then they'll go ahead and slaughter it. Because there's really not a substantial amount of woods for that hog to survive for the amount of time that it has," Dean said. The hog was later euthanized, he said. Per Florida law, movement of feral swine is subject to licensing regulations. Wild hogs are a non-native species that live in all 67 Florida counties, can reach 150 pounds or heavier and measure 5 to 6 feet long, the Florida Fish and Wildlife Conservation Commission reports. The hog was the largest Dean has encountered since 2012. That 485-pound brute behind Melbourne Greyhound Park had been struck by two vehicles. "They hit the hog and they totaled the vehicle out — and the hog just got up and went right back into the woods," Dean recalled. "We actually had to use a front-end loader to load him into the truck, once we got ahold of him," he said. Dean warned residents that "the hogs are runnin'" across the Space Coast, citing the recent cold front and abundance of acorns falling from oak trees. He fielded a call about 4 a.m. Sunday reporting a driver who struck and killed a hog on Babcock Street near Grant-Valkaria. The vehicle sustained extensive front-end damages. He estimated that pig weighed about 145 pounds. Rick Neale is the South Brevard watchdog reporter at FLORIDA TODAY. Contact Neale at 321-242-3638 or rneale@floridatoday.com.